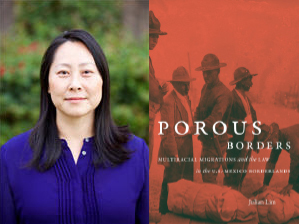 Professor Julian Lim (Arizona State University) will discuss her book Porous Borders: Multiracial Migrations and the Law in the U.S.-Mexico Borderlands (UNC Press, 2017), examining the ways in which immigration policies and national identities developed in response to the historical intermixing among populations of the borderlands between the U.S. and Mexico. 6:00 p.m – 7:30 p.m.
With the railroad’s arrival in the late nineteenth century, immigrants of all colors rushed to the U.S.-Mexico borderlands, transforming the region into a booming international hub of economic and human activity. Following the stream of Mexican, Chinese, and African American migration, Julian Lim presents a fresh study of the multiracial intersections of the borderlands, where diverse peoples crossed multiple boundaries in search of new economic opportunities and social relations. However, as these migrants came together in ways that blurred and confounded elite expectations of racial order, both the United States and Mexico resorted to increasingly exclusionary immigration policies in order to make the multiracial populations of the borderlands less visible within the body politic, and to remove them from the boundaries of national identity altogether. Using a variety of English- and Spanish-language primary sources from both sides of the border, Lim reveals how a borderlands region that has traditionally been defined by Mexican-Anglo relations was in fact shaped by a diverse population that came together dynamically through work and play, in the streets and in homes, through war and marriage, and in the very act of crossing the border. The book is based on her dissertation, which received the Outstanding Dissertation Award from the Immigration and Ethnic History Society, as well as the Messenger-Chalmers Prize and the Guilford Prize, both from Cornell University. Julian Lim is an assistant professor of History at Arizona State University. She holds a B.A. in literature and a law degree from U.C. Berkeley, and received her Ph.D. in History from Cornell University. Trained in history and law, she focuses on immigration, borders, and race, and has taught in both history department and law school settings. Professor Lim has published articles on race, immigration and refugee law, and the U.S.-Mexico borderlands in the Pacific Historical Review, the California Law Review, and the U.C. Irvine Law Review. She is also the recipient of multiple research and travel awards and fellowships. She is currently working on two separate projects: the first is a book about marriage priorities in U.S. immigration law, and the second is a co-authored book (with Gabriel Jack Chin) about Asian exclusions in U.S. immigration and naturalization law.